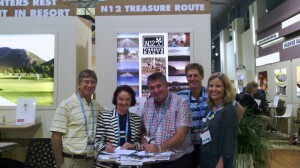 The Sustainable Tourism Partnership Programme (STPP) and the N12 Treasure Route Association (N12 TRA), have officially sealed their agreement to collaborate on a mass scale Sustainable Tourism Initiative at the Tourism Indaba in Durban on 11 May 2014. The N12TRA chairperson, Rob Trautmann, says that he is very excited about making the vision of the N12 TRA a reality by collaborating with the STPP. The combined initiative will see the STPP, creating sustainable tourism awareness and education, running mass scale resource efficiency programmes, running accredited and non-accredited training on the route, helping to create sustainable jobs and setting up local businesses to support the tourism and hospitality industry. The STPP is a mass scale sustainable tourism implementation programme which works through partnerships across a broad spectrum of tourism stakeholders, including public and private sector organization, NGOs, associations and communities to achieve sustainable development. 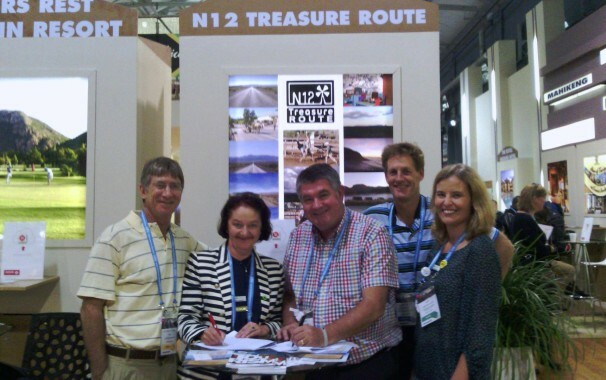 The N12 TRA on the other hand, is a member based marketing organization, with members drawn from 5 provinces and 38 towns on the N12 Treasure Route. The N12 TRA is marketing the N12 TRA … “….and all its amazing stories locally and internationally to become the top Tourism Route and one of the Top 5 Travel Destinations in South Africa, ensuring that we bring benefits to all N12 communities”, says Alan Roxton Wiggill, CEO of the N12 TRA. Alan has recently completed a three week tour of the N12 and has assimilated tremendous support and enthusiasm from organization and individuals along the route. “We have found that people are extremely supportive of sustainable development initiative, they just don’t always know where to start and how to take action within their own environments. The STPP provides this supports and hand-holds everyone who wants to be involved. We have champions in every town” says Caroline Ungesrbock, Co-Founder of the STPP.life The STPP and the N12 TRA are already in the implementation planning stages of the initiative and will commence workshops by mid June 2014.